I made this salad with the ricotta gnocchi. The gnocchi is more on the light side, requiring a protein rich salad. I really enjoyed the freshness of the mango, the creaminess of the avocado, and the savory shrimp. I plan to make this salad again in the future. In a skillet, melt butter and saute garlic until fragrant. Add shrimp and Old Bay. When shrimp turns pink, flip and cook other side. Do not over cook shrimp. Overcooked shrimp is tough! While the shrimp is cooking, cube the mango and avocado. Fill two bowls with greens. 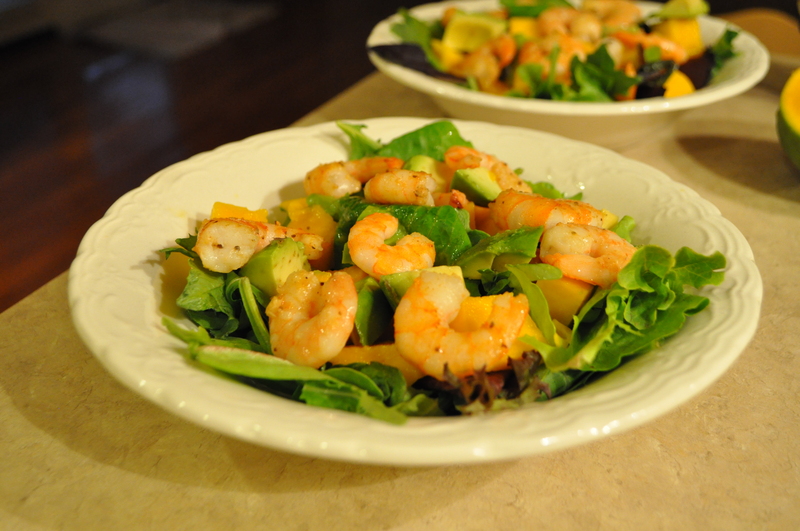 Top greens with equal portions of mango, avocado, and 7 shrimps per salad. Top with desired dressing.